The economy is far from overheated and deflation looks like just as big a risk as inflation right now. For the past few weeks, market watchers have turned their eyes to the Federal Reserve, with commentators closely split on whether or not the Fed would raise its interest rate target at its September meeting. On Thursday, the Fed announced that it will keep its current 0%-0.25% target for the federal funds rate. While some people were surprised by this decision -- and a few claimed that leaving interest rates intact was a big error -- it was really a no-brainer. The Fed's mandate is to maximize employment while keeping inflation in check. That dual mandate, particularly as interpreted in previous Federal Reserve policy statements, clearly doesn't support a rate increase at this time. Those who believe that the Fed should have raised rates last week are mainly worried about low interest rates sparking runaway inflation. A vocal minority of investors and economists have been warning about this possibility for years. Of course, despite short-term interest rates being near zero for the past seven years, there hasn't been any noticeable uptick in inflation. But with the unemployment rate finally closing in on 5% -- often viewed as the "normal" rate of unemployment -- the hawks' arguments are finding a broader audience. Even hawkish observers have admitted that the strong dollar, economic slowdowns in several major U.S. trading partners, and recent stock market volatility made this a less than ideal time to raise rates. However, the hawks argue that there will always be excuses for delaying. Thus, they want the Fed to "just do it" now, claiming that the consequences would be minimal. The problem with this viewpoint is that inflation is extremely low, and has been so for a long time. Raising rates would just further depress inflation below the Fed's 2% target. As the chart above shows, the core PCE index -- which excludes volatile food and energy prices and is the Fed's favored inflation metric -- is well below 2%. Furthermore, it has been trending down for more than a year. 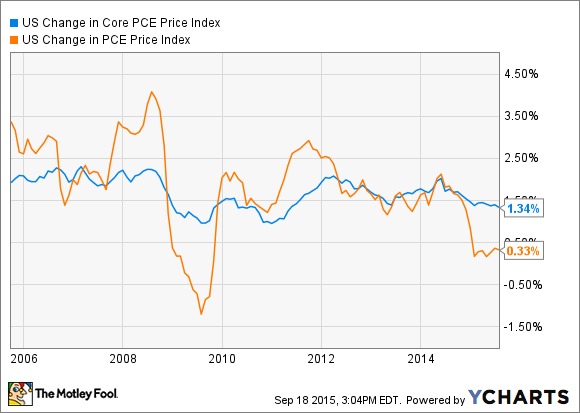 Core PCE has approached the 2% level twice since the Great Recession, but it has fallen back each time. The "headline" PCE index, which includes food and energy, is even lower due to the sharp drop in energy prices over the past year. In fact, that metric is barely in positive territory. To inflation hawks, that might seem fine. 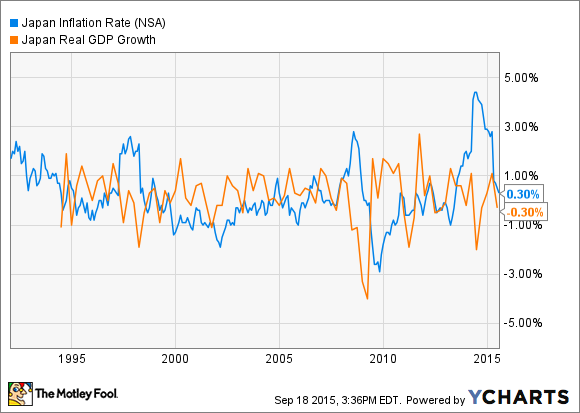 However, deflation is just as big a risk to economic growth as inflation. Inflation has remained persistently low in Japan since the early 1990s, and Japan has experienced long bouts of deflation during that time. The result has been very weak real GDP growth. Even vigorous stimulus efforts by the Bank of Japan -- and more recently, by the government of Shinzo Abe -- have not fully eradicated deflation and economic stagnation. Inflation is still well short of the Fed's 2% target. Furthermore, while the low unemployment figure makes it seem like the economy is running out of slack, that doesn't account for the many people who have been unemployed for so long that they stopped looking for work -- or for people who are involuntarily underemployed. In other words, it would be good to have somewhat higher inflation and it would also be good to have somewhat faster economic growth. Both of those point toward having a looser monetary policy. Federal Reserve Chair Janet Yellen did state several times in her comments to the media last week that the Fed doesn't want to wait until it has reached its 2% inflation target to start raising interest rates. The worry is that inflation could gather enough momentum that the Fed would have to become very aggressive in tightening monetary policy. Such a quick rise in interest rates could damage the economy. However, we're not even close to the 2% target today -- and inflation has been moving in the wrong direction since mid-2014. It's one thing to start raising rates before inflation reaches 2% and quite another to raise rates when inflation is not even moving upwards. There was always a chance that the Fed would raise its interest rate target last week just to create the appearance of normalization. But leaving rates near zero was the obvious call -- and will continue to be the obvious call until the inflation rate starts rising again.